Can you make a face as happy as a dancing hippo or as silly as a gaping fish? 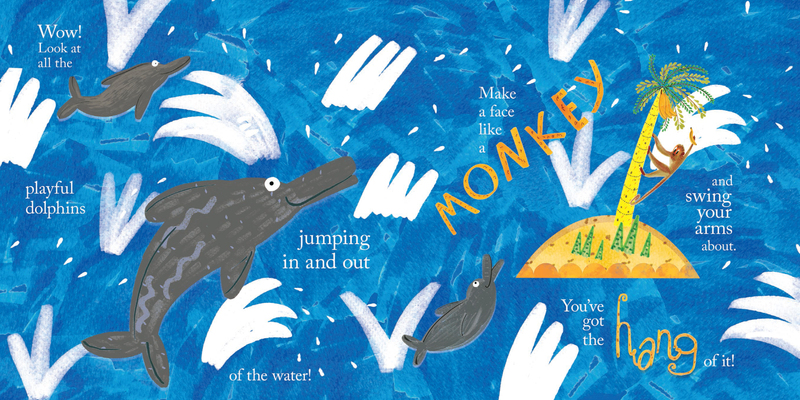 In this riotous, joyful, interactive picture book, emotions and moods are paired with corresponding animals that “come to life” as the young reader performs prompts given by the narrator. 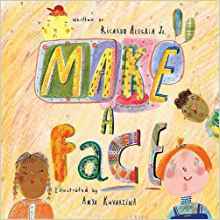 Make a Face is an interactive, concept-driven picture book that shows how different facial expressions connect with different emotions by pairing them with corresponding animals who “come to life” as children make different faces on cue. Can you make a face as happy as a dancing hippo or as serious as a regal lion? Making a “playful face” sends dolphins leaping from the water, and a “frightening face” reveals a great big elephant that’s terrified of a little mouse. While learning how different facial expressions connect with different feelings and concepts, young readers will be enchanted by how their participation generates a magical response at the turn of every page. Stretch those faces, and prepare to use your imagination, because some of them will be challenging, as will getting through the book without dissolving into giggles. About the Author: Born in El Salvador, Ricardo Alegria Jr. came to New York with a lifelong love of stories, poetry, music, and art. He was proud to become a U.S. citizen, having ardently admired the nation’s values and its abundant opportunity. He now lives in a sunny home in Palm Bay, Florida, part of a region known as “Space Coast” where his windows are often rattled by rocket launches and the occasional sonic boom from NASA’s testing facility a few miles down the road. Inspired by his love of classic children’s books like The Cat in the Hat, and Homer Price, Ricardo now writes innovative, whimsical stories he hopes will make kids laugh for generations to come. About the Illustrator: Born in Russia, Anya Kuvarzina always loved “testing out” various pens and pencils at her mother’s stationery shop. She later moved to England at the age of 16, initially to study business, but was introduced to graphic arts almost by accident through an inspiring art tutor and decided to change her career path. After graduating from Central Saint Martins College of Art and Design, Anya worked as a freelance illustrator and graphic designer, before moving to Cambridge where she now lectures in the Masters program in Art and Design at Cambridge School of Visual & Performing Arts. She also co-founded a mural painting collective, Top Stroke, designing window displays and collaborating on charity art projects in the Russian Urals. Her work has been exhibited in London and Cambridge. As a child, she read constantly, and was enchanted by the animal illustrations of Russian illustrator, Yevgeny Charushin. 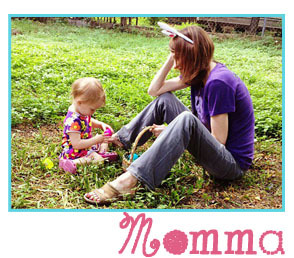 This is her first picture book.